Poor NHL conked out in the car on the way to get his friend a birthday present at about 6:20. 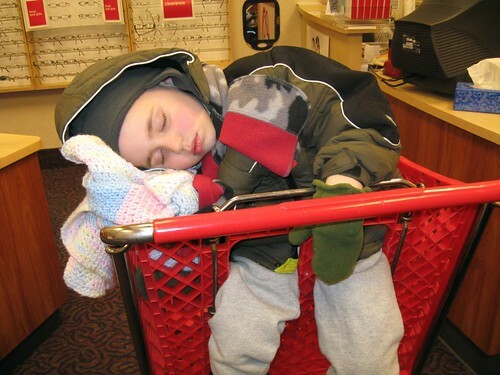 JL managed to take him out of the car, carry him into Target, put him into a cart and then we propped him up using JSL’s blanket. Here is what the tired 4 year old looked like. I’m not sure what was more priceless: (1) When a person passed by us and grabbed his friend and said "Man that dude is passed out!" or (2) The look on JL’s face and the woman helping him get glasses when I pulled out my camera and took the photos. JL should have known I now have my camera with me at almost all times just in case (I learn from the best – JL himself). 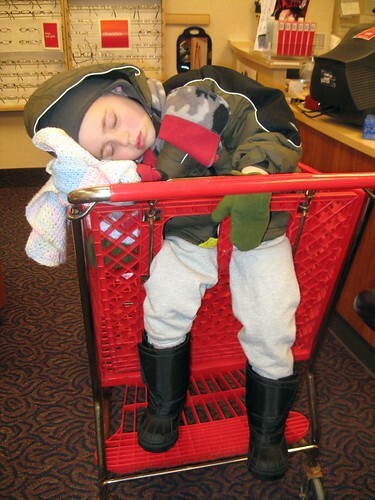 Mind you I goofed and did not have it the other day when JSL fell asleep and we plopped him into the supermarket cart. I did have my cell phone and took a picture that I now have to get off to view. Kids and their odd sleeping poses!